With thousands dead and counting, the ongoing conflict in Syria has become a microcosm for the complicated politics of the region, and an unsavory reflection of the world at large. Against the backdrop of the Arab Spring and the complicated politics of the region, The Suffering Grasses explores the Syrian conflict through the humanity of the civilians who have been killed, abused and displaced. In all such conflicts, it is civilians, women and children, families and whole communities, who suffer at the leisure of those in power. 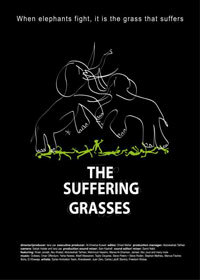 When elephants go to war, it is the grass that suffers.